With the little bit more distance, the three power scope let me see some of the components separate in flight. I actually saw the slug on the final shot. It became unstable passing the 50-yard berm, it's flight became an ever-increasing helical that disappeared in the thick brush surrounding the berm. I'm kidding myself in thinking that any amount of load work can cure the poor design relationship of the center of lift/pressure being aft of the center of gravity. This is simply a no/no in cast bullet design. It is said that the 7/8 ounce slug shoots better but I'm not going to mess with it either as it suffers the same ill. What a rabbit hole. So, I will hunt with the factory ammo as NOEs shuttlecock design will not be in hand in time. You guys that see the projectile are far beyond my skill level. I say you just brush up on your brush skills and become a Ninja. If you get within 50 you're good, right? No more whining. You got this. All kidding aside you have found a lot of caveats with this type of project and have actually solved several problems even if the end result isn't up to your par. I'm betting you used to vow to make a load with cast but at some point you learned that learning only fixes a portion of the issue if one part of a load is messed up. In this case it's the slug that drops from the Lee mold. Ranch Dog wrote: So, I will hunt with the factory ammo as NOEs shuttlecock design will not be in hand in time. 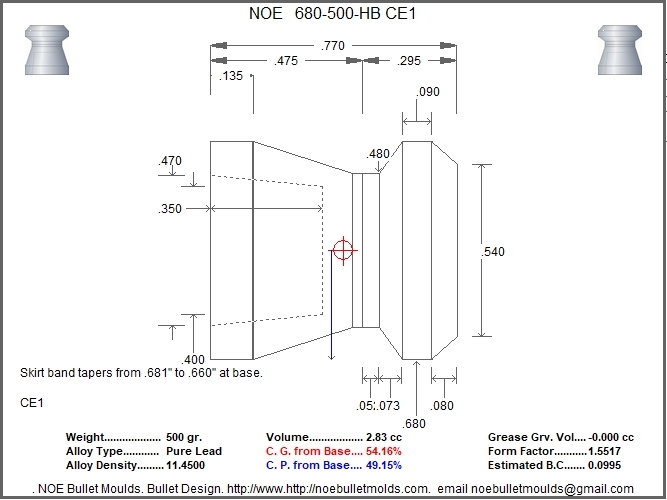 I talked with Al at NOE yesterday afternoon and my 680-500-HB is on the way. Looks like an oversize airgun pellet. Macd wrote: Looks like an oversize airgun pellet. Yep, airgun pellets and this type of projectile are referred to as shuttlecock designs. I do have the same worry with it as I expressed about the Lee slug. Same issue with the CG being so far forward of the CP. That's not a problem with the full-bore bullet. I finally got around to measuring the 100-yard group with the Lightfield 2 3/4" Hyred Elites, 1.239 MOA. I have rifles that cannot shoot that! Ranch Dog wrote: I finally got around to measuring the 100-yard group with the Lightfield 2 3/4" Hyred Elites, 1.239 MOA. I have rifles that cannot shoot that! Ranch Dog wrote: Results from the Texas Parks and Wildlife September public hunts drawings are in, and I was selected for a whitetail and nilgai hunt in November on the East Lake NWR. It is a relatively small unit so hunters must use a muzzleloader or slug gun. Well, sometimes you never know how things are going to work out. I should be leaving in a few minutes for the drive down to the refuge, but instead, I'm going to be sitting out the hunt at home. Actually, on Monday, I had planned to pack go down and pack all my hunt stuff into the refuge but instead, I was seeing my wife off to Houston where she would join her niece and fly on to Pennsylvania. My sister-in-law has not been doing well for a few years, and the two gals decided they needed to get there and have an early week of Thanksgiving with her. I had pressed on with my plans to leave to go on the hunt but as their departure approached so did my apprehension of leaving my 90-year-old dad here alone. He said go, but my gut says don't as this place gets very quiet with when you are by yourself. Yesterday, a few minutes after I woke up at 5 am, the power went out here. It was an area-wide outage as I could not see any lights out on the horizon from my high ground advantage. It was also unusually cold, 28°, and our South Texas homes and buildings cannot sustain that temperature without heat. I texted the power company of my outage and received a text reply that they were aware of the loss and I should prepare for it to be out for up to two hours. I have standby power, and there is no issue with starting the generator, but with the three homes here it does require getting out to work through switches and swing valves to get things powered and water and sewer flowing again. A few minutes for me to do out in the cold, but it would not have been good on my dad. He probably would have sat it out, piling on blankets. Again, not a big deal but it causes a son to be concerned for his dad. Once the sun was up along with the power, I asked him if he wanted to come over for some pancakes. He arrived in minutes! When I told him I was going to stay, he showed disappointment as he knew why, but I explained that with my wife gone we could do some of the things that we have talked about doing. Just some short road trips where we drive past old hunting leases and parts of remote South Texas that we haven't been through in a long time. He knows how much I like hunting, but honestly, a nilgai skull is just another skull on the pile of skulls in the cactus garden than my dog will dig through. Memories are better-served with short road trips! 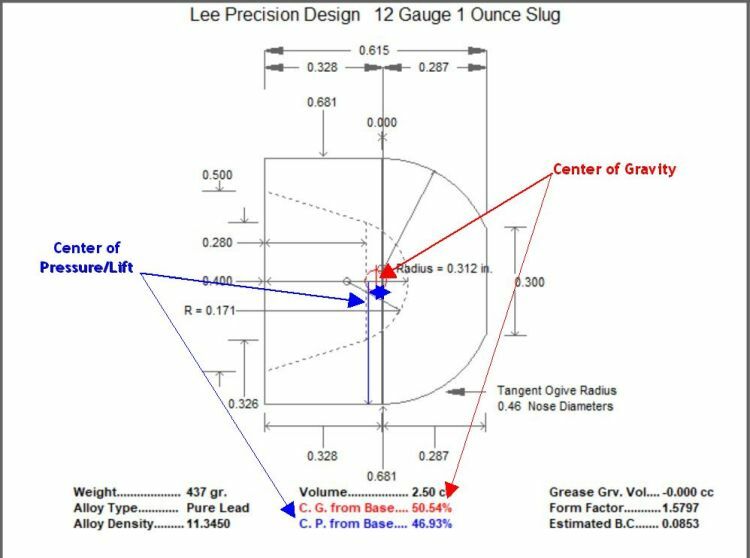 All the posts and preceding pages did get me going on figuring out shotgun slugs. I'm not quite done yet, but it is fun hearing that big lead projectile whack a target backing! Thanks for sharing the story but how about sharing some of that breakfast! GasGuzzler wrote: Thanks for sharing the story but how about sharing some of that breakfast! It's too bad that our group is so spread out, that is something I would like to do.